It has been said that “A full stomach makes for a happy heart.” It has always been my experience that you can find both at every trip to Tassone’s Wine Garden. Tassone’s Wine Garden is located along the shores of the Seneca River, right outside of the Village of Baldwinsville at 8113 Dexter Parkway in Baldwinsville. They are open daily for lunch and dinner (and wine of course!) Monday through Thursday from 11:30 am to 9 pm, Friday and Saturday from 11:30 am to 10 pm, and on Sunday from noon to 9 pm. They have fantastic and original monthly and daily specials so be sure to check out their website at tassoneswinegarden.com and join their mailing list so you can be sure not to miss a thing. Reservations are always accepted for parties big and small so give them a call at 315-635-5133 to book your table, part or event! Tassone’s is in its essence an Italian restaurant, using the Tassone’s traditional family recipes that have been passed down through generations the menu. It is true Italian American comfort food featuring flavors that bring you back to Sunday dinners gathered around grandma’s table. If you order anything “Italian” on the menu you will not be disappointed, it’s their specialty and they have absolutely perfected it. That being said, there are a lot of places in town that do “Italian” well so Tassone’s has made a point of incorporating new and innovative flavors into their menu to satisfy the ever changing palate of customers. They offer nightly specials where they bring new and different ideas to customers and if these ideas become a hit they will be incorporated into the menu. When it comes to the menu, let me just say, everything on the menu is delicious. You could literally close your eyes and point to something on the menu and when the server brought it to you it would be absolutely delicious even if it was something you would not have ordinarily ordered. Kyle and I went to Tassone’s Wine Garden on a snowy January night. When we walked in we were immediately greeted by the warm and friendly hostess. We were quickly seated in a cozy booth and greeted by Mary, our fantastic server who has been with Tassone’s for over 25 years. Seeing Mary is one of our favorite aspects of dining at Tassone’s; she always remembers us and Kyle’s favorite dish! That night we started our meal with the Coconut Crusted Shrimp – large coconut shrimp, lightly fried and served with sweet pepper chili glaze, a perfect mix of sweet and spice and an order of Fried Calamari, lightly breaded and served with a garlic sauce and a cocktail sauce. The portion of calamari was very generous and Kyle loved the homemade garlic sauce that added a new and different take on an old favorite. 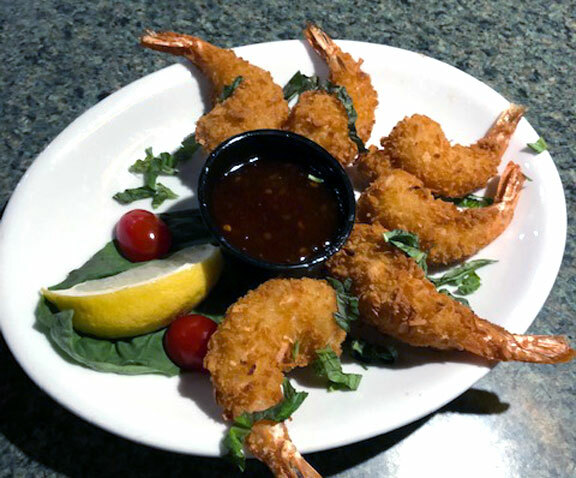 We also enjoyed dipping the calamari in the sweet pepper chili glaze from the Coconut shrimp! We then received a large portion of freshly baked bread with homemade, scrumptious garlic butter. I had a fresh and delicious Caesar salad, topped with homemade croutons and roasted red peppers. Kyle had a cup of French Onion Soup, topped with bubbly cheese; this was a perfect treat to warm up after a cold winter day! 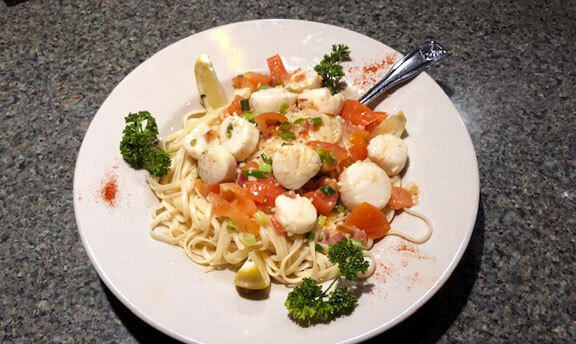 For entrées Kyle had his favorite dish, the Scallops O’Grady, with chopped bacon, scallions, tomatoes and sea scallops sautéed in a light butter lemon-garlic white wine sauce over a bed of linguine. I don’t know how this will translate to writing but this dish tasted like a deconstructed BLT, in an amazing new way. Every single bite was bursting with flavor, it was just so, so, so good. For my entrée I ordered the Roasted Prime Rib, coated with a scrumptious seasoning and cooked to perfection (rare!). This was one of the best cut and preparation of prime rib that I have ever had. Each and every forkful just about melted in my mouth. The entrée came with a side of buttery vegetables and I chose a side of pasta topped with their marinara sauce! Although I was very, very satisfied with my entrée choice I have to say that my other favorite dish is Black & Blue Shrimp and Scallops, sautéed shrimp and sea scallops in a Cajun Alfredo sauce with crumbly bleu cheese served over fettuccine and although I didn’t have it this time I couldn’t leave this dish out of the article! At this point we were stuffed but we had to have at least a few bites of dessert. 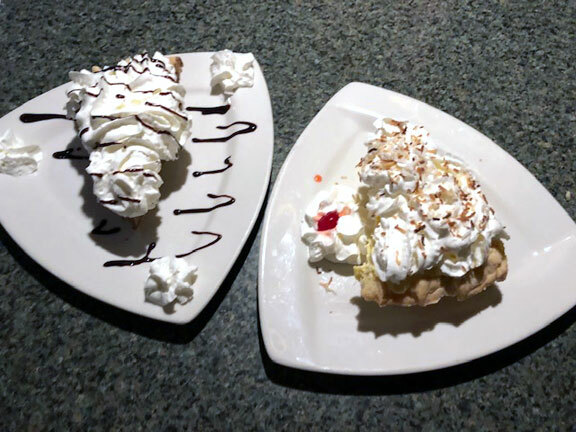 We ordered slices of the coconut cream pie and the chocolate cream pie. These could have been actual slices of heaven. Mary Tassone told us that her mother actually came in and taught the staff how to make her family recipe cream pie. You can taste the love in the flakey crust and the rich yet remarkably light and cloud-like filling. Tassone’s Wine Garden is the perfect venue for your next party or upcoming event; it’s time to start planning that holiday party before dates fill up! Their charming wine garden décor makes them the perfect venue for bridal showers, rehearsal dinners or even intimate wedding receptions. Tassone’s also offers off site catering for parties big and small! They can easily provide an awesome meal for up to 1,000 of your closest friends, guests, or coworkers! After all, if you love the food at Tassone’s you might as well share it with everyone! Tassone’s also specializes in off site catering- let them bring their delicious food to your venue! They have many options to fit your needs and a catering menu is available on the website at http://www.tassoneswinegarden.com/Catering/Summary.aspx but Tassone’s specializes in custom packages to meet your needs exactly. It’s engagement season and if there is some new bling in your future you should absolutely contact Tassone’s if you are thinking about any type of venue where you can bring your own catering! Gone are the days of “chicken or beef.” Let Tassone’s help you build a custom menu that will leave your guests talking for years! Tassone’s Wine Garden is a friendly and comfortable atmosphere and the food is freshly prepared with most of the items made on site. 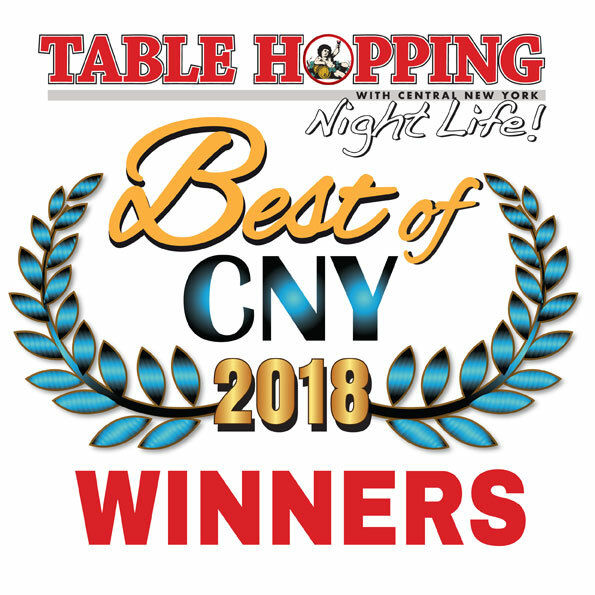 The delicious food, comfortable atmosphere and specular service is definitely why Tassone’s Wine Garden has been a part of Central New York dining for over 25 years! It is a perfect place for an intimate date night dinner or even a family gathering! After your meal, don’t forget to pick up some of the freshly baked cookies to go! Check out their web site www.tassoneswinegarden.com and be sure you delight your palate and try Tassone’s Wine Garden today. Coconut cream pie and chocolate cream pie.